BASE Play RBI is a program offered by the Border Youth Athletic Association. This program combines athletic development with academic improvement for kids in our economically distressed communities. I invite you to look them up at http://www.BorderYouth.org. This entry was posted on Tuesday, January 22nd, 2019 at 8:52 AM and is filed under Uncategorized. You can follow any responses to this entry through the RSS 2.0 feed. You can leave a response, or trackback from your own site. Perhaps if detailed financial data were presented on their website so actual return on investment could be understood I would have fewer questions. When I see stuff like the Columbia study which apparently asked kids four questions about nutrition and found most could barely answer one, I ask myself if investing millions of dollars in baseball infrastructure (and read their plans page to see the start of a lobbying effort for more public money spent on parks to better support league play) to serve a few hundred kids would be as effective as a less infrastructure heavy program simply focused on mentoring at risk kids. I also find it interesting that no gender data is presented in discussing clients served. Are boys and girls enrolled in the program at equal levels or is this a program that by its nature benefits boys more than girls? Yeah, I know they let girls play now, but given that Major League Baseball doesn’t have female players, girls are less likely to benefit or be attracted to this program and the connection with Major League Baseball is highly touted. Most importantly, the infograph above raises questions. 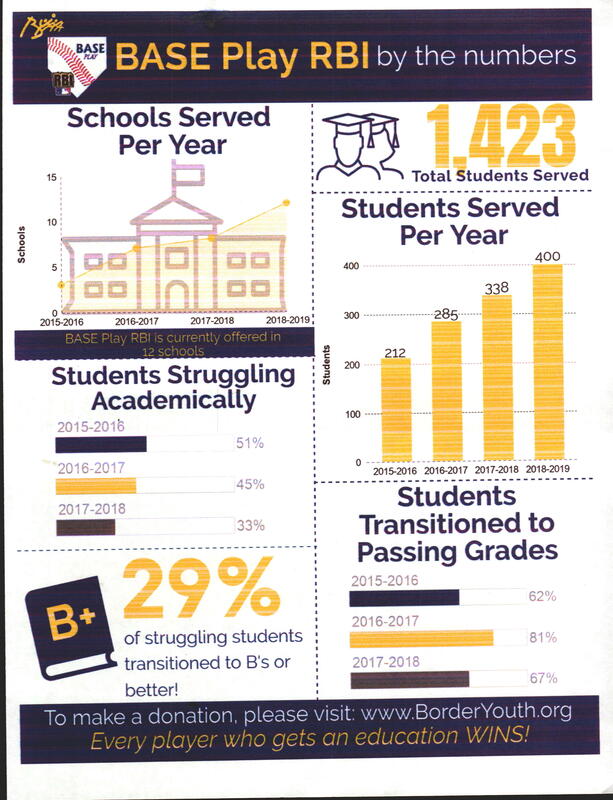 The data suggests that 2017 results were better than 2018 results in terms of academic outcomes(students transitioning to passing grades). What was done differently in 2017? Did expansion of the program negatively impact results? Was there a change in programming that was less effective? Unfortunately, nothing in the reporting on their website answers those questions. It’s just a lot of slick PR talking about how good the program is. All the questions posted by Anonymous are valid. But, can you imagine the cost for the organization in question to post all that information on its website? His last sentence indicates that his DISLIKE button is in over-drive. And I thought I was a Cynical, Sarcastic, Judgmental, SOB. At this point, I will follow George Bernard Shaw’s advice about wrestling with a pig. Time to disengage and actually do something. It’s a nonprofit that apparently feeds at the public money trough via schools so asking for transparency in financial reporting shouldn’t be an issue. And as to the cost issue, entities that are dependent on grants and public funds are required to do detailed metrics reporting to justify the money they get from the larger entities they receive money from. Most legitimate nonprofits these days publish a detailed annual report at least online to allow contributors to better understand how funds are used. This isn’t a special effort, it is just a sharing of data they already have to collect. Lack of transparency is a red flag. It kind of surprises me that CSJSOB wouldn’t realize that. You do realize that at the bottom of their webpage they are selling $75 a month memberships to their indoor practice facility and several hundred dollar coaching packages with Chihuahua team members? This looks a lot like an organization that cloaks itself as a noble nonprofit while enriching itself via grants and fees. I wonder how much the taxpayers of Clint ISD are getting charged for this “partnership”. On the other hand, non-profits have bills to pay for their facilities, utilities and staff, and the materials and services they provide. I respectfully suggest that Anonymous should check out the facility and the program before he criticizes it.